Foramen Lacerum: Foramen Lacerum is a triangular opening located in the middle cranial fossa, allowing for a few vessels to pass through it. It measures about 9mm in length and 7mm in breadth. In Latin it translates to “Lacerated Piercing“. Where is Foramen Lacerum located? 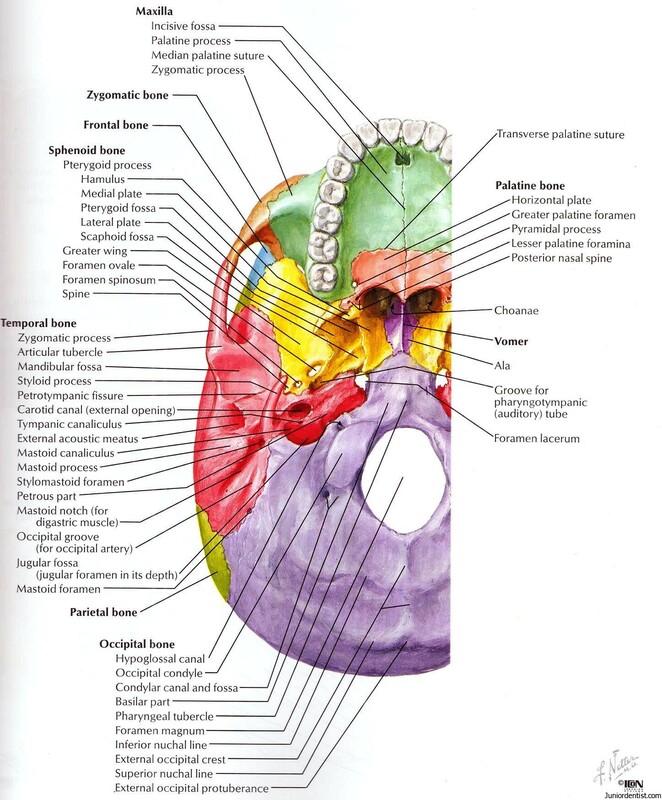 The foramen is located between the sphenoid bone, apex of petrous temporal and basilar part of occipital. It is situated anteromedial to carotid canal. The anterior border of Foramen lacerum is formed by the body of sphenoid bone, and its posterior body is formed by petrous apex, while the medial border is formed by basilar part of occipital bone. Emissary vein – Actually a group of veins that connect the pterygoid plexus and intracranial cavernous sinus. Internal carotid artery – It partially traverses through the foramen, and the artery, vein of pterygoid canal pass through along with it. One Unique feature of foramen lacerum when compared to other foramen is that it is filled with connective tissue and meningeal branches from the ascending pharyngela artery and emissary veins are transmitted from the cavernous sinus into the pterygoid plexus. The internal carotid artery which is one of the structures passing through the foramen passes along its superior surface and does not traverse it. The Connective tissue or cartilage is formed after birth and the Foramen lacerum is filled with it after birth. This has not been much studied or documented as it does not have much importance in intracranial surgeries. Foramen Lacerum acts as a pathway for tumors to enter into the cranium, the tumors which make Lacerum as a portal of entry are – Nasopharyngeal Carcinoma, Lymphoma, Juvenile anjiofibroma, adenoid cystic carcinoma and Melanoma. The other important foramen of the skull include foramen magnum, infraorbital foramen, supraorbital foramen, foramen rotundum and foramen ovale among others.